Speaking of Austria, an immediate association that many people will come up with is the vibrant ball culture that the country is internationally famous for. The most famous ball of Vienna is the "Wiener Opernball" or "Vienna Opera Ball", but there are plenty of others. The capital Vienna takes the lead when it comes to balls, but Salzburg, Innsbruck and Graz have their own culture concerning this kind of social gathering. In 2007, the Opera Ball only had a total revenue of 20 Million Euros - you can imagine how important balls are for the Austrian economy if you hear that there are more than 1,000 balls held the country every year with 2,5 Million people attending them. To present a complete overview on all the balls that take place in a single season, guides and schedules are published. The ball season lasts from the 11th of November, 11:11 a.m. until Mardi Gras and peaks in the weeks preceding the end. Top venues like the Redoutensäle of the Hofburg in Vienna or the main hall of the Rathaus City Hall are booked solid. On average, every visitors spent 205 Euros on a ball night in 2007. The money goes towards hairstyle, dresses, tickets, food and drink, taxi, shoes and dancing lessons. 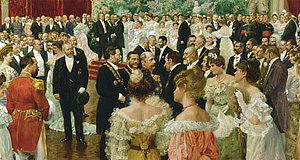 Speaking of dancing lessons: In Austria, giving a debut at a ball represents the formal introduction of a young lady or gentleman to society and thus the first ball is still a big deal especially in Vienna, Salzburg, Graz and Innsbruck. In preparation for this debut, young people at 15 or 16 years usually attend ballroom dancing classes at professional dancing schools that cover some etiquette, too. Many of these schools are rather snobbish institutions and there is a well-known social ranking to the various dancing schools of Vienna - not dissimilar from gangs in proper cities. A "redoute", by the way, is a masked ball and has become rather uncommon even in Vienna, once a hot-spot for redoutes. The most famous one is the "Rudolfina Redoute", which is organised by a fraternity and held annually in the Hofburg. Ladies have to attend wearing a masque that covers the eyes, gentlemen attend unmasked. Beyond such very formal events, there are plenty of other balls at different degrees of formality. A "Kränzchen" is usually an informal ball, often attended in costumes. The "Edelweißkränzchen" in Salzburg underlines the cultural independence of the city by a dress code requiring traditional clothing, such as lederhosen and dirndl dresses. The HIV-charity ball "Life Ball" in Vienna, with 2007 as successful as the Vienna Opera Ball, is famous for its unconventional clothing and popular with the gay and fashion scenes as well as artists. Thereby, it developed its own, unwritten dress code. A "Nuit Blanche" is a social gathering (possibly, but not necessarily a ball) that requires white clothing. Other less formal balls usually specify "evening wear" on the invitation cards, but tolerate anything from a semi-decent jacket for men and even summer dresses for women. These are usually school balls or smaller events organised by societies. Formal balls always specify the dress code on the invitation cards or advertisements. They usually require dinner jackets less commonly even swallow-tail coats for gentlemen and formal dresses for ladies. The latter ones pin up their hair, both men and women with medals and honorary emblems wear them since a ball is considered a public, official occasion. Army members, high-ranking police officers and alike often wear gala uniforms.